Director Guillermo Del Toro is usually able to maintain that tricky balance between critical and commercial success; well-received efforts like Blade II, both Hellboy movies, and the landmark Pan's Labyrinth pleased picky people in both camps, affording the Mexican director a great deal of creative control and enough money to buy all kinds of sweet pop culture collectibles. Even lesser efforts like the big, dumb Pacific Rim and 2015's creepy but somewhat unsatisfying Crimson Peak had their own share of strengths -- but since the director's last borderline-great work was ten years ago, it's good to know that this balance has been somewhat restored with The Shape of Water (2017). Offering both a strong return on its modest $19M budget and thirteen nominations at this year's Oscars (just one shy of the record shared by All About Eve, Titanic, and La La Land), this sci-fi romance obviously landed with -- wait for it -- quite a splash. 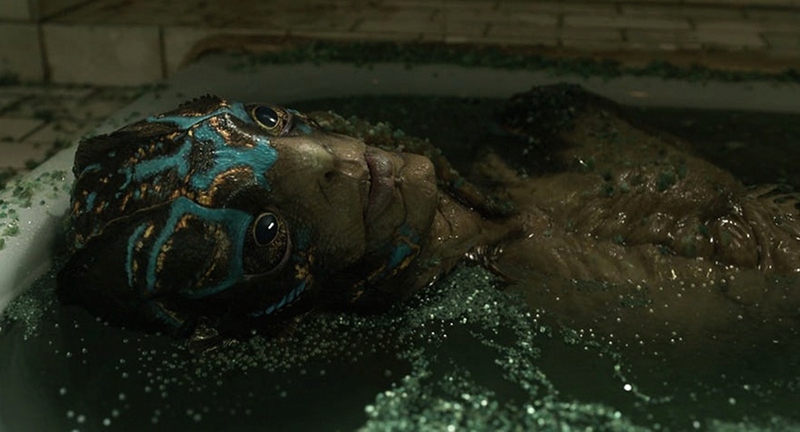 The Shape of Water's biggest draw is the inter-species romance at its core: obviously inspired by the likes of Beauty and the Beast and Creature from the Black Lagoon, it pairs mute cleaning woman Elisa Esposito (Sally Hawkins) with a tall, muscular amphibious creature (referred to as "the asset" by his captors, and played wonderfully by Doug Jones) that just might be a South American river god. They first meet at her place of employment, a top-secret government laboratory with questionable security, and share a love of hard-boiled eggs that's strengthened by their outsider personalities. Elisa communicates through sign and body language, which "the asset" is eventually able to understand and even reciprocate. But make no mistake about it: their time together is limited, as he's routinely tortured by Colonel Richard Strickland (Michael Shannon) and couldn't survive for long if he were able to escape. With the help of her only two friends -- neighbor Giles (Richard Jenkins) and co-worker Zelda (Octavia Spencer) -- Elisa tries to break him out anyway. Like the unconventional romance between woman and beast, large portions of The Shape of Water's plot sound flimsy on paper but end up kind of working. Its strongest moments are between the two leads, who play off one another perfectly despite the almost complete lack of traditional language (the lone exception being a loopy but enjoyable song-and-dance dream sequence). Alexandre Desplat's score is another easy standout, as is the fantastic production and costume design that work together to create a visually appealing and memorable world. 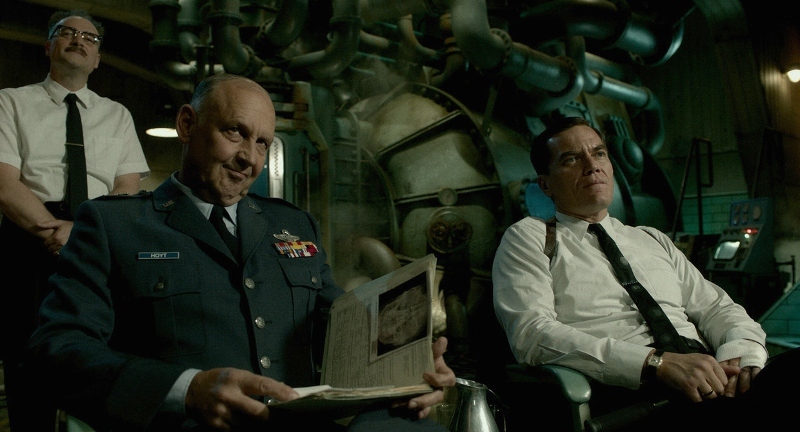 But aside from those obvious strengths, The Shape of Water plays it disappointingly straight at times: many of the supporting characters are painfully one-dimensional (Colonel Strickland and Zelda, particularly), the plot is extremely predictable, and the heavy-handed sermons undercut some of its obvious goodwill and charm. But I'll admit that lofty expectations are the biggest culprit: once all that Oscar dust settles, The Shape of Water should hold up nicely despite feeling a bit overrated right now. Fox's new Blu-ray/DVD combo pack (also available in 4K UHD) offers a decent amount of support, even if it's not the all-inclusive package that accompanies most Del Toro films on home video. Serving up a pitch-perfect A/V presentation and a small but interesting little collection of bonus features, die-hard and curious fans alike should enjoy the bulk of what's here. I wouldn't be surprised, however, if a more definite package surfaces within a year or two. Presented in its original 1.78:1 aspect ratio, The Shape of Water looks as good as you'd expect for a big studio film still playing in a handful of theaters nationwide. As expected for a production that's heavily stylized and changes emotional tone abruptly at times, the visuals follow suit with several different color palettes and light levels that range from attractive outdoor locales to dimly-lit and intimidating quarters. It's not far removed from the director's previous work in a visual sense, although The Shape of Water approaches Amelie levels of color saturation (specifically, orange and turquoise) with a purposeful dreamlike haziness during several stretches. The good news is that Fox's Blu-ray handles everything quite well with strong image detail, texture, and black levels that feel deep without swallowing up everything else. Digital imperfections such as edge enhancement, noise, and excessive DNR could not be spotted along the way. Aside from the separately available UHD 4K release, The Shape of Water won't look better on disc anytime soon. Equally impressive is this Blu-ray's default DTS-HD 5.1 Master Audio mix, which serves up a very strong and capable presentation that consistently draws in attention and holds it tightly at times. Alexandre Desplat's score sounds especially full here -- it's given all five main channels on some occasions, while the crisp dialogue occupies most of the front with good separation and dynamic range. Sound effects (rushing water, specifically) occasionally offer a hefty presence and noticeable panning. Overall, The Shape of Water sounds just as smooth and polished as it looks, and I can't imagine any new or returning viewers will be anything but happy with this Blu-ray presentation. Optional Spanish and French Dolby Digital 5.1 dubs are included during the main feature, as well as subtitles in English (foreign language translation only), full English SDH, French, and Spanish. It's also worth noting that Elisa's sign language translation, though obviously player generated, appears to be burnt in to the image even with the subtitles turned completely off. The film's striking poster artwork (seen above) is used for the cover and matching outer slip, which was obviously printed before the Oscars as it advertises the film's staggering thirteen nominations. This two-disc release (one Blu-ray, one DVD) arrives in a dual-hubbed eco-friendly keepcase along with a Digital Copy redemption slip. The menu interface is beautifully done -- simple and atmospheric, with smooth navigation and music/scenes from the main feature. Unlike most Guillermo del Toro Blu-rays, The Shape of Water isn't exactly loaded with bonus features but we at least get a few interesting bits and pieces. The main attraction here is a series of short to mid-length Featurettes -- the best of the bunch is "A Fairy Tale for Troubled Times" (28:55), which mainly deals with the film's inception, development, visual design, and Alexandre Desplat's score, with a good amount of direct input from key members of the cast and crew. A two-part "Anatomy of a Scene" breaks down various elements of the prologue and dance scenes (8:04 total), while "Shaping the Waves: A Conversation with James Jean" (5:04) speaks with the American-Taiwanese visual artist about his other poster for the film. Finally, "Guillermo del Toro's Master Class" (13:28) takes more of a Q&A format which has the director enthusiastically and candidly answering a few questions about the film's technical aspects. We also get three Theatrical Trailers for The Shape of Water (6:55), plus a few sneak peeks at upcoming Fox home video titles. The Shape of Water, though certainly not the pinnacle of Guillermo Del Toro's career, represents a half-step up from recent films like Pacific Rim and Crimson Peak -- not enough to warrant its huge footprint at this year's Oscars, but there's still a lot to enjoy about this visually outstanding and heartfelt production. The two (largely silent) main performances and Alexandre Desplat's score carry most of the film's emotional weight, while the fantastic production and costume design defy The Shape of Water's modest budget. It's an incredibly immersive and atmospheric experience -- yet one that feels more than a little derivative of past films and the director's own work, as everything aside from its obvious strengths doesn't stand out all that much. Either way, it's well worth a watch and Fox's Blu-ray is solid enough: offering a top-tier A/V presentation and a few interesting extras, this one may just get better with age. Recommended.